Ask fellow campers about "Riverfront Park Campground" and nearby attractions. We stayed here in early March as my husband was in town hunting snow geese. We absolutely loved this city park! It was our first time camping in a city park and there was so much to do and see, especially for our kids. The campground is located right next to the Illinois River and has wonderful views of the river itself. 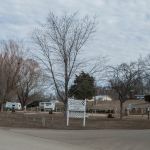 The park is a quick walk away, with two playgrounds, picnic areas, a walking trail and an amazing view of the town's bridge. There are 12 sites here, with electrical and water hook ups. Since we were here in the off-season, we did not have water hook ups or restroom facilities as both were closed off for the season, so if you plan to come during the off-season make sure you come equipped with water and restroom facilities. A quick drive over the town's bridge takes you to the heart of the Illinois wildlife country. The Emiquon National Wildlife Refuge is about a 10 minute drive from the campground and is worth a visit. It's unreal! The amount of waterfowl we saw was incredible and we were fortunate to see 10 eagles over the course of the weekend. We will definitely be staying in this campground when we return to the area. This little town knows how to utilize it's riverfront and the outskirts of town are just beautiful. Although she wasn't staying on site yet, the host of the campground came by and introduced herself and provided a lot of helpful information. We will be back! We camped at Riverfront Park Campground in a Truck Camper. Riverfront Park area offers playgrounds, picnic areas, walking trails and wonderful views of the river. You can also fish the river from certain areas. Emiquon National Wildlife Refuge is a must! As its name implies, the park is adjacent to the Illinois river. The sites are all back-in and pads are about 40 ft in length with some additional room at the back. Bathroom is at the nature center just across the entry road. Pads are gravel with grass in between. There is a water connection for each site but most are at the back of the sites and shared between two sites so require a long hose. Dump station is along the road along the park. Passes to the nearby swimming pool are available during the season. The park is well kept and the nature center and nearby boat launch ramp are well used by the town residents. It is a typical riverfront park, only 5-10 feet above river level so it has nice views of the river. That also makes it subject to seasonal flooding so be sure to call ahead for conditions, especially in the spring. It is just a short walk to the downtown area where there is a hardware store, Dollar store and a few restaurants, Grandpa's was quite good. Nice walking trails in the park and a longer trail out to a river island if the water is not too high. The Emiquon Nature Preserve is just across the river as is Dixon Mounds Museum. 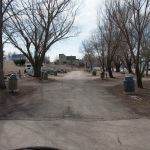 We camped at Riverfront Park Campground in a Motorhome. Are you affiliated with Riverfront Park Campground ?